I crashed my bike Friday evening (4/29/16) on Tower Grove Avenue – a rock and pothole in the bike lane launched me over my handlebars, landed me in the ER, and caused hundreds of dollars in damage to my bike and a parked car. I am OK – bruises and abrasions are the worst of it, and I’ll recover fully – but it could have been much worse. The road surface on some of the bike lanes on Tower Grove Avenue is badly deteriorated and full of potholes and rocks; Center Cross Drive in Tower Grove Park is a nightmare best avoided. While potholes aren’t unique to bike lanes, they pose a particular hazard to cyclists. 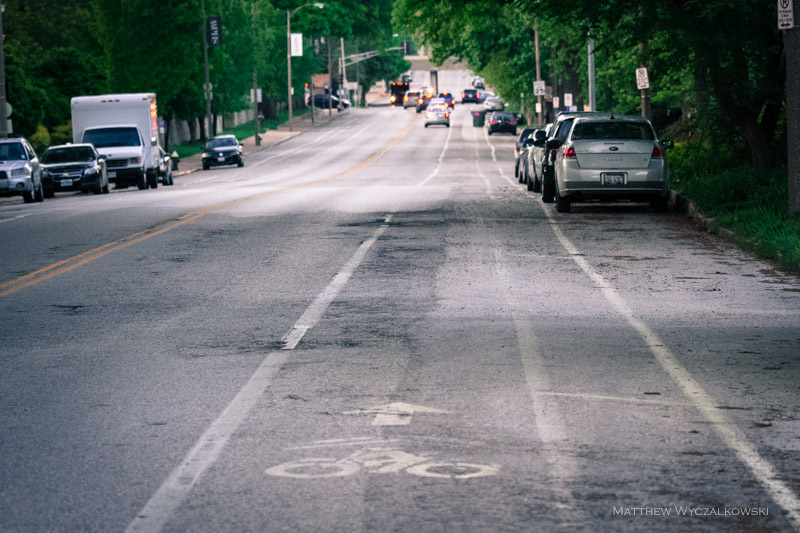 The City’s commitment to improved bike infrastructure cannot stop at painting lines – ongoing maintenance is critical to make cycling safe and attractive in St. Louis. Rocks and potholes in the bike lanes on Tower Grove Avenue. Debris in the roadway here led to a painful and expensive crash. 1 Pings/Trackbacks for "I Crashed on Tower Grove Avenue"